If you live in Goodwood, or perhaps did at some time in your life, I hope that you'll forgive me for saying that it's not the prettiest suburb. 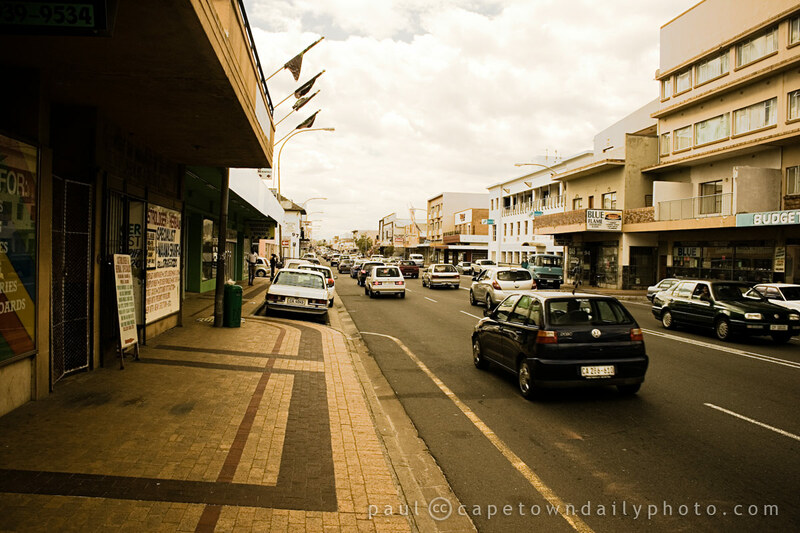 I have lots of memories of the area, though, from visiting girlfriends and skateboarding with my cousin to going to see the annual Christmas-time parade in this, Voortrekker Road. Today the area just looks old and run-down, and from Monday to Saturday during business hours you'll always find the area heavily congested. Posted in Street photography and tagged car, road on Friday, 13 November, 2009 by Paul. Have you ever seen that Stephen King movie “Langoliers”? No Jonathan, I haven’t seen Langoliers yet… but the photos on the Web are freegin’ scary bro. You’re right however, it does look like it’s right out of the 1970s. I’m hoping that once the Cape Town Partnership are done with the beautification of the inner-city, they are someone else will set their sights on the “mini” CBD’s we have around the city, such as Goodwood and Bellville. Some beautification and modernisation along with maintenance is all that is needed to get them up to scratch again. I quite like that Voortrekker Road (and certain areas of Monte Vista, Plumstead, …) are still as they were. The so-called “modernisation” is happening too quickly in too many places and it’s wiping away our history and heritage, especially how it is embodied by architecture. Modernisation doesn’t have to wipe away our heritage. Look at Cape Quarter. It’s a beautiful example of how we can modernise without wiping away our history. They knocked down most of the buildings in Cape Quarter and most of the businesses relocated or closed. Have you been to Cape Quarter now that it’s reopened? That above statement is not true. The entire idea behind the project was to salvage as much of the original building facades as possible, whilst expanding the actual mall. As a result we have a very unique-looking building that celebrates historical architecture and modern contemporary architecture. The mall itself is buzzing. Your comment suggests that it’s dead now that construction is complete, which can’t be further from the truth. Cape Quarter-like developments that are sensitive to the past whilst adjusting to the needs of the present and future are what we need instead of building large glitzy malls out in the middle of nowhere. One also needs to keep in mind that whilst much of our past architecture is beautiful, the brutalist architecture of the 70’s is not much to be proud of. There’s most certainly no danger of it being wiped from the face of the country. The above photo is a great example of how, despite the area in question being clean, the architecture suggests a dirty/grimy neighbourhood. Some fresh coats of paint, new facades, glass replacements and new developments would no doubt lead to the rejuvenation of the area, which is the exact stance the City of Johannesburg is taking with many of their run-down buildings. That policy is working wonders. I’m saying it lost its original identity because the original businesses moved and all but, maximum, the facades were removed. In effect, what is now left is but a facade of the past. For what? More places where people can go and spend money they don’t have on things they don’t need. 70’s architecture has as much a place as any other architecture. And it will all be removed as soon as they get to it. And as Jonathan said, it’s not worth preserving when a lot of 70’s developments were designed by engineers and not architects. In other words, they were constructed without design in mind. Considering 70’s residential towers are all over the place, we most certainly aren’t going to see them disappear ever. Actually I liked the old M-Net building. So go ahead and laugh at that. Not everything is about aesthetics but I have found that that is not a discussion I can have with people with whom that seems to be their only concern. But to speak your language I also mentioned other (Cape Town residential) areas, which are moving from beautiful, open garden areas, and cared for pavements/verges to high walls, security fences, and paved front gardens. You may possibly tell me that’s necessary because of crime. I will argue that a vigilant neighbourhood that actually cares about its fellow human beings is very effective in preventing crime. And when it comes to rampant consumerism, which is destroying the earth, I think it’s everyone’s interest what people are needlessly spending their money on. That is one of my fears. I know crime in Gauteng is not like it is here (the first time I went to JHB – a few years ago only – I was totally taken aback at how bad the security stuff is; I really thought all the talk was hyperbole but numerous Carte Blanche episodes have put me straight). I am already missing how “open” suburbs used to feel and you could walk down the road and see all the care and attention that people had put into their gardens, which they *wanted* people to enjoy. The walls in my neighbourhood have slowly been going up for years and there’s less of that “community” and open feeling now (although thankfully it’s still there, to a degree), so I like going to less “revitalised” suburbs where a lot of this is still in place. For now. Mjw, you are totally correct in saying that not everything is about aesthetics. However, your comment confuses me as you can’t seem to provide sufficient reasoning – or logical reasoning for that matter – as to why aesthetics can’t take the limelight when they in no way hinder usability. To be quite honest, I have no interest in high walls, security fences and paved front gardens, and I’m not sure why you brought that up as it has little – if anything – to do with the modernisation of business districts. What residents do with their own homes is of no concern to me. Furthermore, there’s a clear shift in Cape Town from urban floor to high-density sustainable development. The city itself is promoting it, and I see the evidence around me. The regeneration of the CBD thanks to the Cape Town Partnership will only help further promote inner-city living, and as crime rates drop there will be less motivation for residents to erect high walls around their homes. Lastly, it seems you have indeed confirmed my suspicions regarding you being anti-development, as like it or not, rampant consumerism is here to stay. Ironically, however, modernisation of older buildings in many cases makes them far more eco-friendly than they were, and new developments have to very specific standards they have to live up to. I’m quite sick of people talking the talk, but not walking the walk, as if they indeed posessed this extreme concern for the earth, they wouldn’t be living in cities in the first place. Complainting based upon factors that are simply impossible to change is exactly the negative mindset some need to rid themselves of if they want people to listen to them. I find it hard to take you seriously when you make such extreme and ill-informed statements as you have. One minute you want to preserve the un-eco-friendly architecture of the past, and the next we aen’t allowed to modernise them. You can’t expect new developments not to occur, and should be thankful that recent trends favour the perservation of historical architecture. You were quick to attack one point I initially made so I was just curious as to why you weren’t attacking all of them. Now you have. Also, you don’t know me. You don’t know my contribution, or lack thereof, with regards to environmental factors. “Like it or not, rampant consumerism is here to stay” is a terrible position to take. Especially because it’s unsustainable. That is the kind of mindset we need to move away from. And my point was never about preserving un-eco-friendly buildings. My point was about preserving heritage and that I don’t believe that by gutting an entire building save the facade that one is doing that. Making a building more eco friendly while you create the building for the purpose of sustaining consumerism is, once again, another kind of facade. If the city really cared about eco matters there would be a proper, citywide recycling initiative in place. For starters. Building/building owners would be encouraged to develop rooftop gardens. Retailers would be chided for stocking items using unnecessary packaging. …. The list is very long. It’s hardly been tackled with a few updated building requirements. That is welcome, but it’s barely a start. Whoot, it looks like I missed a doozie here. The key words are “some beautification” and “maintenance”, both which are sorely lacking. If they restore the place to how it was in 1970 then, sure the architecture (nay, engineering) would still not be pretty (IMO), but it would look way more attractive. The reality however is that financially and organisationally I imagine that it’s often just not practically possible to get hundreds of land owners to agree on what to do and (theoretically) government has (IMO) more important things to worry about. Mjw, firstly, your last paragraph is filled with mis-information, as updated building regulations are far from the only steps the city is taking towards greening. Current city administration aims for Cape Town to become one of the world’s leading Green Cities (something you would know were you deeply involved with environmental matters – as I correctly assumed you weren’t), and plenty of information is available as to how they plan to achieve that. However, all of this is beside your original point which is that modernisation supposedly wipes away our heritage and history, which you’ve yet to prove as true. I’ve given you a perfect example of how modernisation can be sensitive to our heritage – Cape Quarter – yet instead of disproving my point, you went on a tangent about consumerism etc. which has absolutely nothing to do with my point. The exact same mindset was adopted by certain “concerned environmentalists” when Greenpoint Stadium – now known as Cape Town Stadium – was approved. They argued that it would “spoil” Cape Town and detract from its natural beauty. Fast-forward to the end of last month and Signal Hill is jam-packed with eager residents wanting to catch a glimpse of it all lit up at night. Where are the environmentalists now? You’d be hard-pressed to find many people that would be willing to argue that it is a blemish on the face of the city as it would be predicted to be. More ironically, yet, is that instead of a dirty, run-down stadium surrounded by equally dirty open field, we get a beautiful urban park and new facilities that promote a healthy and active lifestyle. Some lacked the vision to see exactly how Cape Town Stadium would prove an asset to the stadium, and it seems that may be the case here where you’d argue that the area in the above photo promotes a safer, more appealing lifestyle than a modernised version would. Wow. You are a ridiculous projector, continuously make sweeping assumptions about me (most of which are actually incorrect), and you just don’t stop. Beyond The Wall » Our First Test Run! Was idly googling away on a quiet day and happened on this interaction..I worked opposite Blue Flame in the picture and it actually depicts part of Voortrekker Road in Parow although the Blue Flame HQ is in Goodwood. I have’nt really read all the comments but it always amazes me that as soon as negative comments are made..albeit completely accurate..the accusations and finger pointing starts – I wonder if that would happen if all the parties were face to face as it were..nevertheless I liked Jonathan’s referring to the Langoliers..very apt if unsubtle fortunately I don’t think anyone else has seen the movie or the analogy may prove uncomfortable for some…I grew up in Goodwood and spent many happy hours in Voortrekker Road before Malls were created , even in daylight I would think twice about walking anywhere very far from my car now and the influx of foreign Africans and the Chinese stores (horrible) are quickly changing the character of the suburb forever..Memories will be all that’s left! Hi, I lived in Goodwood and South Africa from about 196O ro 1962. Now I live in France. I was eighteen when I left with my parents. My parents owned the Colywood Café, opposite the Liberty Cinema. I used to spend some of my evenings with the projectionist and his friends, in the projection box. Is anybody old enough to remember that? I’ve got an old photo of the Liberty Cinema. I’d gladly post it on here. I’d love to know what happened to the old Liberty Cinema. I see from Google maps that the café is now a clothing factory. I live in Goodwood. Always have, since birth 88′. Nice people living here, though, as in the rest of the country, there are always bad elements. Good thing the Neighborhood Watch is growing (people are getting gatvol). Voortrekker Rd is a mess. Some of the buildings give a nostalgic feeling. Remembering the big board close to Oscava Flats with the big Benson & Hedges cigarettes advert. There are still good places to go and people to meet. There’s an exciting WhatsApp group called “Goodwood Gemeenskap” administered by myself. We meet up and get to know new people from the group every once in a while. I remember the Liberty cinema as I grew up in the area. Not sure of dates but in closed in the 80’s and was taken over by Pierces Second hand shop. He was also on Voortrekker Road, a short distance away.. Near the end of the cinema’s life, it was also know as the bug house. I am not sure, but when Pieces finally closed down, the building was demolished – should be somewhere in the 90’s..
Also I am not sure of your age but would like to know if you remember anything about the Blue Moon cinema. This was down Vasco Boulevard..
Hope the above information is of use.